Download entry as Lucid Scribe Data (LSD), view the source or watch the video. First dream captured with modified NeuroSky MindWave. Anyone familiar with the MindWave knows its design makes sleeping with it on nearly impossible. 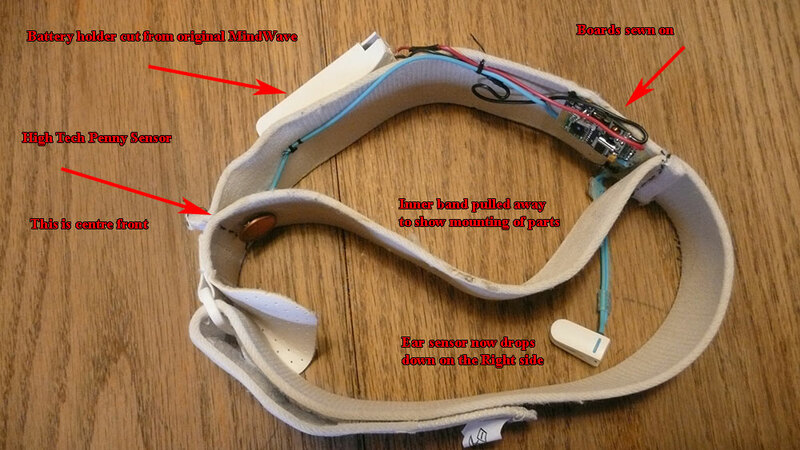 I took mine apart and remounted the boards, contacts and battery (crudely) in a elastic headband. Now it is possible to sleep with it on. Thought I’d do the process in bullet form. To be used in conjunction with the attached pics. Unfortunately I didn’t take step by step pics but it is really pretty simple. If I forgot anything feel free to ask. Remove all the stickers from the mind wave including the large circular one that says NeuroSky MindWave. They just peel off. The blue wires Going to the forehead sensor can be carefully pried out of the sides. Gently remove the boards and refer to pics for wiring scheme. These wires/connections are fragile! Buy a battery holder or cut away the original one and add wires to be able to mount it in a more comfortable position. Mount into headband as suits your needs. After a few nights of recording brainwaves from the NeuroSky MindWave and some advice from a cognitive scientist, I was able to write an algorithm to detect REM sleep from the raw EEG data. Thirteen blinks can be seen in the minute featured above. They look uncannily similar to the rapid eye movements previously recorded with the halograph FM. The audio track was triggered five times throughout the night and interrupted REM sleep at least once. Also of interest is that the attention graph tends to spike during REM sleep, when the meditation graph tends to trough. NeuroSky was kind enough to send me a MindWave EEG headset and will be making Lucid Scribe available from their store! The hour featured above shows some interesting patterns that might be indicative of REM sleep that I have yet to investigate.